When you think of spirits or ghosts, what comes to mind? Often it is a place we as humans have covered up and ignored. I mean, how often do we talk about this in school? In church? Or on the news? Crickets . . . . right? This subject is a place that honestly spooks many people. That is why I am going to talk about how not to be intimidated by an entity. What if everyone could communicate with spirits? What if talking with entities could be ease filled? Would you be willing to have that as a possibility for you? 1) If you run into a spirit, or disembodied entity, you can always ask “Do you know you don’t have a body?” This awareness alone triggers their empowerment. They no longer feel stuck. Because thought forms are instantaneous in the astral etheric plane, often times this is enough empowerment for them to remember they are an infinite being. Then they can go find the place where they can begin to create their next adventure with and in a body of their own. Many of them will chose to stick around. What if that were ok? Particularly if they like it here, and are not doing any harm? 2) If your awareness of entities opens up to the point where you begin to receive many entity visitors, you can tell them you have ‘office hours’ at certain times. Tell them to come back during that time. 3) It is a popular view among new age type people to send them to the light. My view is not to send them to the light as a rule…unless I perceive that would be a contribution to a particular being. They are a free being with free choice. And doing so is another mechanism of control that isn’t honoring of them and their free will choice. If you would like to have empowerment around the world of entities, I highly recommend watching this video. Talk to the Entities with Shannon O’Hara Watching this video shifted my whole world around the world of entities and made it so I experienced much more ease with the world of dis-incarnates. I also recommend purchasing this book Talk To The Entities, by Shannon O’Hara. It demystifies the world of spirits and entities. 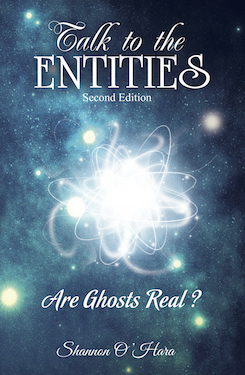 I have much more ease with the world of entities after coming across the information. 1) Stopped making this area so significant? 2) Acknowledged our capacities and awarenesses with entities? What would it take to have ease and joy in your interactions with entities? What if you could communicate with spirits easily?